Today I have one of the Models Own SS12 Kaleidescope collection to show you. I was in Boots the other day buying a few polishes and when I got to the till the cashier told me they were part of the 3 for 2 offer so I could get another free. I ran to the stand and quickly picked one in a rush because I knew I was holding up the queue. There were a few I wanted but this one was in my eye line. When I got home I realised it was actually one of the new shades! Blooming Pink is a bright pink polish with a magenta shimmer. The pink is actually really red leaning so the colour is really summery! I'm not sold on the name... Blooming Pink suggests more of a light spring pink to me and this colour has summer written all over it! The application for this was okay, nothing to rave about. I had to use three coats because two didn't give me as much pigmentation as I wanted but once it was on, I loved it! 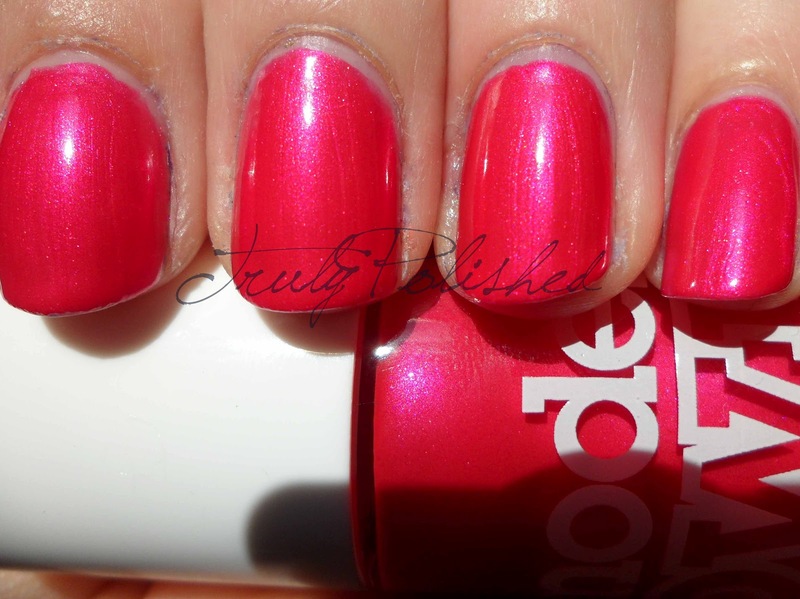 The photos below show three coats of Blooming Pink with one coat of Nº7 Stay Perfect Fast Dry top coat. Click "Read More" to see the rest of my photos and a comparison to a couple of other polishes! When I had this on I couldn't stop looking at the shimmer and it reminded me of two other polishes in my stash: Essie Tour de Finance and Rimmel Pulsating, both of which I've posted in the last couple of weeks, so I had to do a comparison. On my index and ring finger I'm wearing Blooming Pink, I have Tour de Finance on my middle finger and Pulsating on my little finger. As you can see, Blooming Pink has a base colour that is much more red, Tour de Finance is more blue leaning and Pulsating is a lot darker and the colour seems more vibrant. In my books that's an excuse to buy all three! My favourite of these three is Tour de Finance. Colour-wise I love all three, but the formula on Tour de Finance is amazing. It's opaque in one coat, I just use two out of habit! If you like Blooming Pink, you can buy it in store at Boots and on their site, as well as on the Models Own website where it retails for £5.